What Does Human Givens Help? What is the Cost and How long? The cost for these sessions are £65 p/hour and are 1 to 1. The human givens (HG) approach originated in the field of psychotherapy and the many new insights provided by the research of its founders, Joe Griffin and Ivan Tyrrell, have been quietly revolutionising the effective treatment of mental health and behavioural problems for the last 20 years. 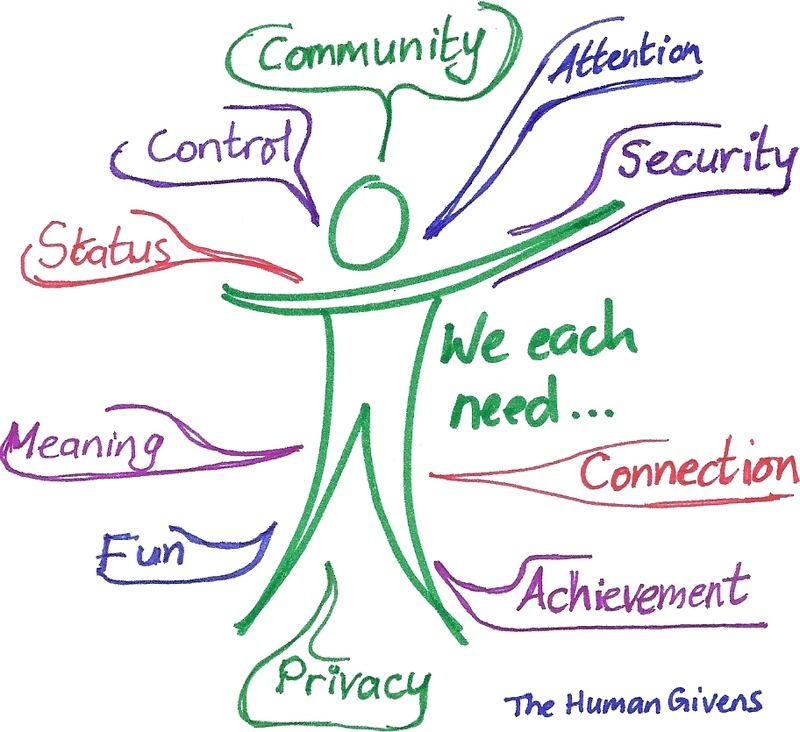 The organising ideas and framework contained in the human givens approach have subsequently been found to be so universally applicable that HG principles are now also used in many other settings, such as education, business and diplomacy – improving outcomes and increasing our understanding of human nature and how to interact with people in a way that enhances their emotional health and helps them make the most of their abilities and talents. How does Human Givens differ from other therapies? The human givens approach – which was developed 20 years ago – derives from the understanding that, when essential emotional needs are met and our innate mental resources are used correctly, a human being will be emotionally and mentally healthy. Essential psychological needs identified over decades of work by health and social psychologists include needs for autonomy, sense of control, security, connection, attention, achievement, status and meaning. Innate resources, much studied by neuroscientists, include our abilities to learn from experience, plan, judge, imagine, relate one thing to another, empathise, develop a moral sense, remember, etc. It is when emotional needs are not adequately met, or are met in unhealthy ways, or when innate resources are damaged for any reason, or are unintentionally misused, that undesirable mental states such as anxiety, anger, depression, addiction and psychosisdevelop. For instance, misuse of the imagination – to conjure up worst possible or threatening scenarios – is a common feature of all these states. The British Psychological Society’s leading peer-reviewed journal, Psychology and Psychotherapy: Theory, Research and Practice published a 12-month evaluation in 2011 of the Human Givens approach in primary care at a general medical practice. The result showed that more than three out of four patients were either symptom-free or reliably changed as a result of HG therapy. This was achieved in an average of only 3.6 sessions, significantly better than the recovery rate published for the UK government’s flagship IAPT (Improving Access to Psychological Therapies) programme, which uses therapists trained in cognitive behavioural therapy (CBT). In 2012 PTSD Resolution, a charity which uses Human Givens therapists to help war veterans suffering from Post Traumatic Stress Disorder and other mental health problems reported an 83 per cent success rate in resolving these issues (findings presented to the British Psychological Society). In September 2012 the Mental Health Review published two peer-reviewed academic papers showing the effectiveness of the Human Givens approach. The first involved the treatment of mild to moderate depression, and the second the therapeutic value of the Human Givens Emotional Needs Audit tool. This research work was done by a distinguished team of academics, Dr Anna Tsaroucha, Professor Paul Kingston, Director of the Centre for Ageing and Mental Health, Dr Ian Walton, General Practitioner and Professor Tony Stewart, Professor in Public Health. It was also independently peer reviewed. The Mental Health Review is an influential, high quality source of information and intelligence for researchers, managers, commissioners, purchasers and practitioners working in the field of mental health, so the content will be noticed. We hope it will also be acted upon, especially since it reveals that huge savings could be made if the Human Givens approach was more widely adopted. Following this review the academics recommend that the HG model be adopted by the NHS as a bona fide model of therapy in its own right. The Human Givens Institute (HGI) is both a membership organisation open to those wishing to support and promote the human givens approach through all forms of psychological, educational and social interactions, and the professional body representing the interests of those in the caring and teaching professions who work in alignment with the best scientific knowledge available about the givens of human nature.